Ultrasound imaging has become ubiquitous in medicine, and those training for a career in the field need a solid understanding of ultrasonic radiation and its application through medical technology. Ultrasonic Bioinstrumentation offers comprehensive explanations that go beyond simple technical procedures; from the physics behind wave propagation and tissue acoustics, to beam patterns, resolution, configurations and more, this book is a one-stop reference for all aspects of ultrasonic imaging. Aspiring technicians will appreciate the depth of information, accessibility, and clarity of both word and image. 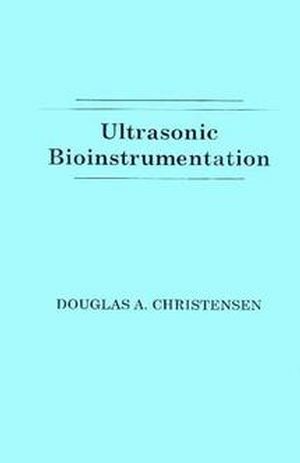 Douglas Christensen is the author of Ultrasonic Bioinstrumentation, published by Wiley. The Wave Equation and Its Solutions. Acoustical Properties of Biological Tissues. Transducers, Beam Patterns, and Resolution. Doppler and Other Ultrasonic Flowmeters. The Safety and Measurement of Ultrasound. Bibliography and Suggestions for Further Reading.